5 THINGS I WISH I HAD KNOWN WHEN I STARTED AIRSOFT! The other day I was going through my old Airsoft photos and I got to thinking about things I wish I had known when I started Airsoft, so I thought this would make the perfect little blog post! Now bear in mind, these things will be completely different for everyone, these are just things I wished I had known. What are yours? Let me know in the comments! 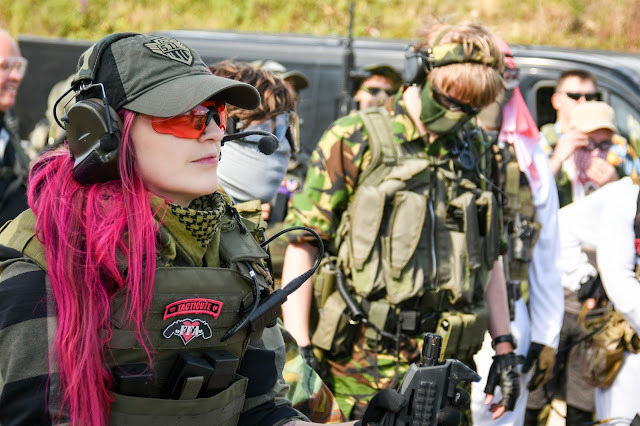 For my second Airsoft game in August 2014, I decided I wanted to look cute (massive mistake and super cringey to say that out loud!). I absolutely hated how camo and tac kit fit and looked on me, so I decided to wear tight black jodhpurs and a tight black Karrimor Jacket - totally impractical but I thought I looked the sh*t so off I went to the game day and promptly got shot in the side of my arm and my thigh. The tight fabric did absolutely nothing to soften the impact and I was left with a couple of large bruises and feeling really embarrassed. After that I decided to stop being silly and revert back to camo but instead go for Multi Terrain Pattern and find something that fit me a little better. It took a few tries to get the loadout to the point I was happy with, but I got there in the end. Everyone has a different opinion on this, whether you wear full face, a mouth guard, shemagh or just choose not to wear any at all, it's a personal choice. For my very first ever game for Airsoft in 2011, I didn't know BBs could take out teeth (clearly I've lived a very sheltered life lol) and I didn't know face pro even existed for this sport so I turned up with just a thin snood to cover my lower face. Half way through the game day my gun battery died (and not knowing I should of left the field to change it) I proceeded to change it in the middle of the field, and promptly got shot in the face. This both hurt and it gave me a shock when I looked in the mirror and saw my cheek bleeding. Since then I have always worn face pro, and the only exception is MilSim. I now wear a tightly wrapped shemagh over my lower face during engagements during MilSim Ops. As I said on that very first game day my gun battery died halfway through the day. As I was a complete beginner I only had a very vague idea how to change the battery, but I was too stubborn to ask for help. It took me around 15 minutes to change it in the end. Looking back (and hindsight is a wonderful thing) I should have left the field and asked a marshal or more experienced player to help. In my experience most Airsofters LOVE talking about their gear and are usually really happy to help another Airsofter out in a pickle. Those of you who know the story behind FFA will know that it was my boyfriend at the time who got me into Airsoft and he pretty much always set my guns and gear up for me so all I had to do was get dressed, turn up and play. When I started the blog I began to learn the basics of my kit and guns but when I ended the relationship I was on my own, so I had a lot to learn and a short amount of time to do it. From what kit worked for me, to how to zero in a sight to learning how to use molle correctly it was a steep learning curve but I'm glad that I now took the time to research and learn my kit so I have that independence. Whilst getting help from other players is a great source of info, don't rely on others completely. Shortly after I started playing, I started to wonder just how many people played Airsoft, so I searched Facebook and Instagram for groups and other players. I quickly found loads of Airsoft accounts on Instagram and started following them and on Facebook I discovered community groups with thousands of members! These groups are a great resource for tips, help with loadouts, kit sales (no RIFs tho), finding businesses/companies that stock specific items, site recommendations etc! Having a group of like-minded people in a hobby is also a great way to meet new friends and get the most out of the sport! Embrace the community and be a positive entity within it!